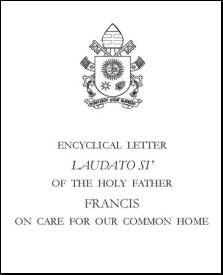 The full encyclical is available here. It's less than 200 short pages, written in a simple, everyday style, and is the work of a thoughtful and caring person. Francis's encyclical, Laudato Si, is much more than a commentary on climate change; it's a sweeping indictment of the entire global capitalist system that's wrecking the planet. Those who say that the Pope shouldn't get involved in the issue of what's happening to Planet Earth and all its inhabitants are either very stupid or very afraid. Or, in the case of the political establishment, both. They have good reason to be afraid. Francis's encyclical, Laudato Si, is much more than a commentary on climate change; it's a sweeping indictment of the entire global capitalist system that's wrecking the planet. 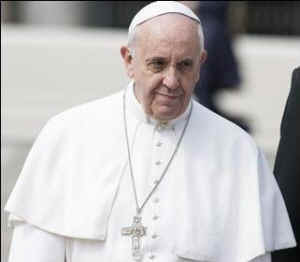 Not that the Pope is a Marxist, as some of his critics like to label him. Far from it. The whole miserable Soviet system that promised a "paradise" to the working people of the world collapsed of its own dead weight in the early 1990s, leaving the field to its great competitor. But 25 years later, one can only conclude that globalized capitalism is no paradise either. It's turned out to be every bit as much a monster, leaving us in the early stages of an unfolding catastrophe. "Mother Earth," the letter begins, "burdened and laid waste, is among the most abandoned and maltreated of our poor; she 'groans in travail' (Romans 8:22). "We have forgotten that we ourselves are dust of the earth; our very bodies are made up of her elements, we breathe her air and we receive life and refreshment from her waters." Francis quotes liberally from previous popes and church leaders (among them many non-Catholics). In 1971, Pope Paul VI said that "due to an ill-considered exploitation of nature, humanity runs the risk of destroying it and becoming in turn a victim of this degradation." John Paul II warned that human beings seem to see "no other meaning in their natural environ­ment than what serves for immediate use and consumption." Benedict XVI said that the natural environment has been gravely damaged by our irresponsible behavior. And, among other religious leaders, Patriarch Bartholomew has said that "for hu­man beings… to destroy the biological diversity of God’s creation ... to degrade the integrity of the earth ... to contaminate the earth’s waters, its land, its air, and its life – these are sins ... and to commit a crime against the natural world is a sin against ourselves and a sin against God." Francis writes that this crime against nature begins "when we no longer recognize any higher instance than ourselves, when we see nothing else but ourselves." And surely that, in a nutshell, is what the global capitalist system offers – pure greed and selfishness. He communed with all creation ... for to him each and every creature was a sister united to him by bonds of affection. That is why he felt called to care for all that exists. And what has our modern, self-centered civilization made of all creation? "The earth, our home," he writes, "is beginning to look more and more like an immense pile of filth ... These problems are closely linked to a throwaway culture that affects the excluded [disadvantaged communities] just as it quickly reduces things to rubbish." Only after thus setting the stage, and for next 30 of its 184 pages, does the letter lay out the scientific evidence for what's happening to the Earth and its inhabitants. It's one of the clearest and most concise explanations of what's happening. And it's indisputable. A very solid scientific consensus indicates that we are presently witness­ing a disturbing warming of the climatic system ... The melting in the polar ice caps and in high altitude plains can lead to the dan­gerous release of methane gas, while the decom­position of frozen organic material can further increase the emission of carbon dioxide. Things are made worse by the loss of tropical forests which would otherwise help to mitigate climate change. Carbon dioxide pollution increases the acidification of the oceans and compromises the marine food chain. If present trends continue, this century may well witness extraordinary cli­mate change and an unprecedented destruction of ecosystems, with serious consequences for all of us. That's what the science says, and these would-be leaders of the world's #1 capitalist nation can bob and weave from "I'm not a scientist" to "Leave it to the scientists" as much as they want, but they can no more turn back the waters of rising sea levels than could old King Canute. Francis addresses this denial and obfuscation directly when he writes that "many of those who possess more resources and economic or political power seem mostly to be concerned with masking the problems or con­cealing their symptoms." When he warns that "an acute water shortage may occur within a few decades unless urgent action is taken," he is, in fact, being quite mild in that the war that has now taken over most of the Middle East can be traced to a drought that began in Syria and is spreading through the entire region. It is not enough, however, to think of dif­ferent species merely as potential "resources" to be exploited, while overlooking the fact that they have value in themselves. Then he turns more directly to the system itself that's causing such massive destruction. The degree of human intervention, often in the service of busi­ness interests and consumerism, is actually mak­ing our earth less rich and beautiful, ever more limited and gray, even as technological advances and consumer goods continue to abound limitlessly. We seem to think that we can substitute an irreplaceable and irretrievable beauty with some­thing that we have created ourselves. Writing about the dying of coral reefs, he quotes bishops in the Philippines who ask, "Who turned the wonderworld of the seas into under­water cemeteries bereft of color and life?" The failure of global summits on the environment make it plain that our politics are subject to technology and finance. There are too many special interests, and economic interests easily end up trumping the common good and manipulating information so that their own plans will not be affected. Saving banks at any cost, making the public pay the price, foregoing a firm commitment to reviewing and reforming the entire system, only reaffirms the absolute power of a financial system, a power which has no future and will only give rise to new crises after a slow, costly and only apparent recovery. ... We need to reject a magical conception of the market that would suggest that problems can be solved simply by an increase in the profits of companies or individuals. To blame population growth instead of extreme and selective consumerism on the part of some, is one way of refusing to face the issues ... Approximately a third of all food produced is discarded, and whenever food is thrown out it is as if it were stolen from the table of the poor. He adds that it is not only those who "uphold the myth of progress and tell us that ecological problems will solve themselves simply with the application of new technology and without any need for ethical considerations or deep change" who are driving the unfolding catastrophe. He also points the finger at those of us who view humankind itself as the threat and who argue for a reduction in our numbers. He concedes that "attention needs to be paid to imbalances in population density." But a human population racing toward nine billion people is still most definitely a problem. Having laid out the problem as he sees it, Francis explores it from the viewpoint of Christian teaching, beginning with the story of the Garden of Eden and how our relationship to each other, to nature and to the divine have become broken. This rupture is sin. The harmony between the Creator, humanity and creation as a whole was disrupted by our presuming to take the place of God and refusing to acknowledge our creaturely limitations. This in turn distorted our mandate to "have dominion" over the earth, to "till it and keep it." He suggests that this fundamental rupture can indeed be healed, and that the key lies in "the harmony that Saint Francis of Assisi experienced with all creatures." Saint Bonaventure held that, through universal reconciliation with every creature, Saint Fran­cis in some way returned to the state of original innocence. This is a far cry from our situation today, where sin is manifest in all its destructive power in wars, the various forms of violence and abuse, the abandonment of the most vulnerable, and attacks on nature. He returns to the myth of human progress, talking about "the tendency to believe that every increase in power means an increase of ‘progress’ itself, an advance in security, usefulness, welfare and vigor," when, of course, all the evidence points to the fact that we feel less secure and less confident than ever. Some circles maintain that current economics and technology will solve all environmental problems, and argue, in popular and non-technical terms, that the problems of global hunger and poverty will be resolved simply by market growth. To seek only a technical remedy to each environmental problem that comes up is to separate what is in reality interconnected and to mask the true and deepest problems of the global system. That deepest of problems, he suggests, is a culture that "drives one person to take advantage of another, to treat others as mere objects, imposing forced labor on them or enslaving them to pay their debts." The same kind of thinking leads to the sexual exploitation of children and abandonment of the elderly who no longer serve our interests. It is also the mindset of those who say: Let us allow the invisible forces of the market to regulate the economy, and consider their impact on society and nature as collateral damage. In the absence of objective truths or sound principles other than the satisfaction of our own desires and immediate needs, what limits can be placed on human trafficking, organized crime, the drug trade, commerce in blood diamonds and the fur of endangered species? Where, then, do we go from here in taking up the "great cultural, spiritual and educational challenge [that] stands before us?" I would like to offer Christians a few suggestions for an ecological spirituality grounded in the convictions of our faith. His basic answer is what he calls "conversion", but not the parody of being "born again" in today's faux Christianity. Instead, Francis quotes a group of Australian bishops who write about how we can achieve "reconciliation with creation." To achieve such reconciliation, we must examine our lives and acknowledge the ways in which we have harmed God’s creation through our actions and our failure to act. We need to experience a conversion, or change of heart. He says that when we become captivated by the notion of "limitless mastery over everything", all we end up achieving is destruction. Instead, we need to embrace "care for nature [as] part of a lifestyle that includes the capacity for living together and communion [in] a universal fraternity" that includes each other, our fellow animals and the whole of nature. We read in the Gospel that Jesus says of the birds of the air that “not one of them is forgotten before God” (Luke 12:6). How then can we possibly mistreat them or cause them harm? I ask all Christians to recognize and to live fully this dimension of their conversion. And while Francis always refers to God as the Father, he concludes by turning to Mary the Mother, "who cared for Jesus [and] now cares with maternal affection and pain for this wounded world." Just as her pierced heart mourned the death of Jesus, so now she grieves for the sufferings of the crucified poor and for the creatures of this world laid waste by human power. Perhaps those who have, so far, responded that the church should stick to matters of theology and ethics and not get involved in politics and science would help themselves by at least reading Francis's letter. But that's unlikely ever to happen. They are in thrall to the very interests he's writing about. Unlike his critics, Francis feels he has nothing to lose by telling the truth as he sees it and inviting us all to be "converted" to a more respectful relationship to our fellow animals and to the planet that's our only home.